While I love sharing recipes, I’m more of a make-it-up-as-you-go kind of girl at heart. I start with a craving and then choose the type of meal I want to make (soup, tacos, slow-cooker, stir-fry, lettuce wrap, salad, appetizer, etc.) and go from there. And when it comes to delivery vehicles, I love me a good stuffed mushroom. Mushrooms lend themselves nicely to whatever you’re making as they take on the flavor of the surrounding ingredients. So the other day when I was craving chorizo I thought it’d be a mushroom-match made in heaven, and man was I right. Chorizo packs a big punch, so you don’t need much else in the way of ingredients. Here I add spinach, garlic, onions, and a bit of almond flour – but that’s it. 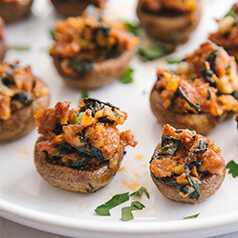 These are Whole30, paleo, and keto-friendly, and the bite-sized mushrooms make for a tasty party passer or snack on a cozy winter day. Remove mushroom stems. Save ½ of the stems, trim ends, and chop. Brush mushrooms with olive oil and place on a parchment-lined baking sheet. Sauté the garlic, onions, and mushroom stems in the ghee until soft, about 5 minutes. Fold in the chopped spinach and almond meal. Sauté for 5 minutes then remove mixture from pan. Add the chorizo to the pan and cook on medium, being sure to break up the chorizo you go. We’re not worrying about cooking the chorizo all the way through, because it will bake in the oven. Cook in the pan for about 3-5 minutes, then fold in the spinach mixture and combine evenly. Spoon the mixture into the mushrooms. I like to make more room in the mushrooms by spreading the mushroom out with my finger, gently pushing back the sides. Use the mixture generously so they are stuffed. Depending on the size of your mushrooms, you’ll likely have a little extra mixture – but this isn’t a bad thing. You can use it in a breakfast scramble or sauté it up for a lettuce wrap. Bake mushrooms in a 400° F oven for about 20 minutes. Enjoy! Tip: If you want to make these Whole30/Paleo-friendly, be sure to labels – not all chorizo is created equally, but there are great no-sugar options out there like Pederson’s Natural Farms.